Call the store to reserve your spot. Angelia is a 2007 BHG Scrapbooks etc. Creative Team member. She is a 2006 Creating Keepsakes Hall of Fame Winner, a 2005 Memory Makers Master, and a 2004 PaperKuts Power Team winner. In the past she has worked with some of the top manufacturers in this industry - Junkitz, Li'l Davis Designs, Deja Views, and Me & My Big Ideas. Currently she designs projects for K&Company. 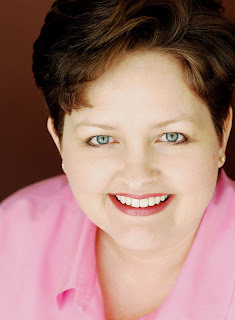 Her layouts, cards, and altered items have been published in many scrapbooking and paper crafting magazines and idea books. We are very excited to have Angelia in July. Titles in the Round - 2 hours Friday 3pm to 5pm $40 Ever feel that you've run out of creative title ideas? Want some inspiration and new treatments for titles that are anything but straight or boring? Join Angelia in this class packed with ideas and sample layouts. You'll create THREE 12X12 layouts using Scenic Route's Laurel collection with titles that go "round and round". This bright, bold, fun class with lots of patterned paper and circle ideas will have you creating "outside your box" in no time! Family Life Altered Tag Album - 2 hours Friday 8pm to 10 pm $45 This 7 Gypsies tag book is all about family. Using black and white, and K&Company's Amy Butler blue and green patterned papers, you will create an album with many layers. 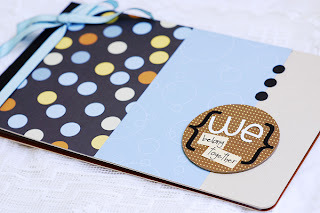 You will incorporate interactive details such as a hidden journaling tag, a transparent window tag, and a pocket tag. Ribbons, buttons, rhinestones, Prima flowers, and 7 Gypsies stickers will complete your creation! Beat The Heat - 2 hours Saturday 10am to12noon $40 Are you often intimidated by patterned papers? Do you yearn for a deeper, more varied look on your pages, but fear cutting those precious patterns or worry that it will turn out too busy for your photos? This class is for you. Patterned papers are meant to be fun. Mixing and matching is the BEST part! In this class, you will create THREE 12X12 layouts with Scenic Route's Metropolis line of blues, greens, white, and pop of orange. All 3 layouts will be suitable for boys and girls of all ages. 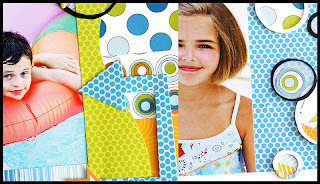 Playful patterns, creative details, and a splash of "cool" techniques will have your summer themed layouts going in the right direction! French Twist Tag Album - 2 hours Saturday 7:30pm to 9:30pm $45 Don't you love techniques that can be used over and over again, and yet they never get old? 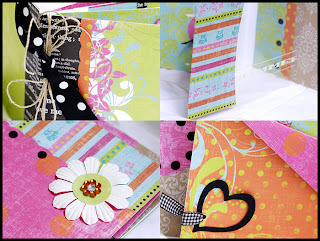 In class, learn to make your own 5"X6.5" tag book from scratch, as we create and decorate this brightly colored album. Papers from Autumn Leaves French Twist collection, Making Memories, and 7 Gypsies give this project instant color WOW! Adorable additions include paper flowers, rhinestones, rubons, ribbon, decorative brads, transparency, and hemp.